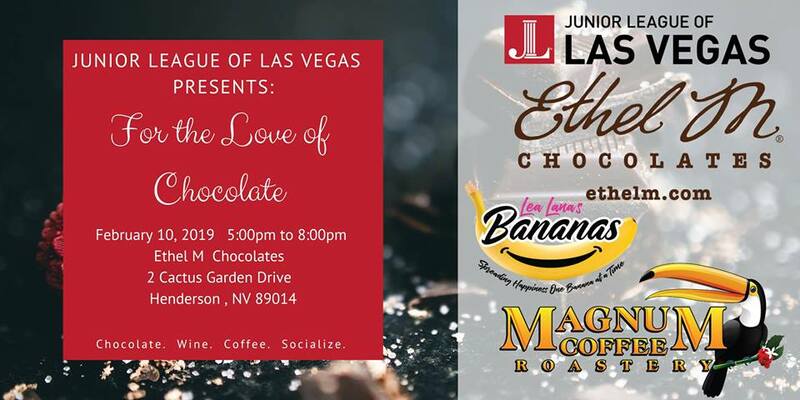 Come celebrate Valentine’s Day early at Ethel M. Enjoy a night of chocolate, wine, and coffee on February 10, 2019, from 5 – 8PM. Start the evening with Ethel M chocolate and wine pairings in their Tasting Room and receive an exclusive discount at the chocolate shop. Venture outside for gourmet chocolate-dipped frozen banana pops by Lea Lana’s Bananas and coffee from Magnum Coffee. Wander underneath the stars at Ethel M Cactus Garden while sipping Magnum coffee and devouring chocolate. Raffle prizes are up for grabs! Guests will leave with a swag bag of goodies courtesy of our sponsors, Ethel M, Magnum Coffee, and Lea Lana’s Bananas. VIP ticket holders will receive a surprise upgrade in their swag bag.